If you're looking for some spooky fun near your Oakville apartment, Rockliffe Residences can help! We've found the best Halloween fun Oakville has to offer. Take a guided tour through old Oakville and learn about the spooky history of the city. Costumed tour guides take you on a walk that lasts about an hour, all the while sharing stories of ghosts and eerie events that happened right here in our city. Walks occur Monday to Saturday and all ages are welcome. It's worth the drive to Springridge Farm this October! The Harvest Festival is open weekends with loads of fun for children of all ages. Enjoy puppet shows, wagon rides, farm yard pipe slides, a chicken show, goat mountain, spooky boo barn, and so much more - all just 25 minutes from our Nelson Street community! Halloween fun is headed to the St. Volodymyr Cultural Centre! Families can take part in the 5 km trail run or the family-friendly Creepy Mile. Have a blast with a selection of Halloween activities including face painting, a magic show, and free family photos. Come in costume for the run and bring a flashlight. Medals will be awarded to all who complete the run. 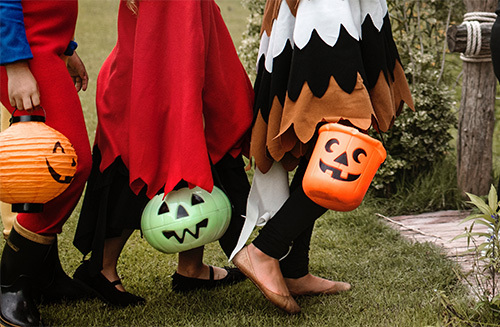 Kids who complete the Creepy Mile, decorated with large glowing Halloween inflatables, will receive a ribbon as well as free pizza and hot chocolate. You can find additional race details here. Oakville's Towne Square will be bustling with trick or treaters on Halloween morning! Kids can trick or treat through the merchants for some fantastic treats, and parents can enjoy shopping and dining the rest of the afternoon. We wish all of our residents a fun-filled and safe Halloween!